Lake Ventura is a sandpit lake located near the Platte River in eastern Nebraska. The lake was formed by gravel mining operations which created a sand bottom pit that filled with groundwater. Over time, large amounts of phosphorus accumulated in the lake bottom sediments and became the primary source of phosphorus to the lake. Water quality deteriorated with increased internal loading and total phosphorus in the water column ranged well over 100 ppb. In May of 2007, Lake Ventura was treated with Alum to control internal phosphorus loading and generally increase water quality. 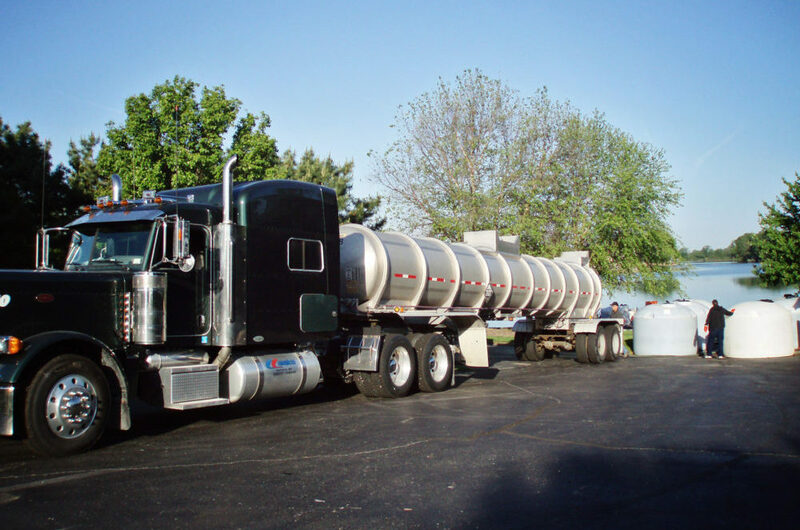 Phosphorus levels were monitored during the summers of 2007-2009 to determine the effectiveness of the treatment in controlling internal loading and reducing the amount of phosphorus in the lake. Dissolved phosphorus was monitored three feet above the lake bottom as an estimate of the amount of phosphorus leaving the sediments. 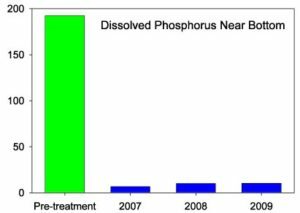 The following graph shows the Treatment reduced dissolved phosphorus near the bottom from 192 ppb (pre-treatment) to 8.6 ppb (post-treatment average). This indicates a 96% reduction in internal phosphorus loading! Total phosphorus levels were also monitored three feet below the lake surface to determine how much phosphorus was available to fuel algal growth. The following graph shows a reduction from 130 ppb (pre-treatment) to 30 ppb (post-treatment average). This is a 77% reduction!